The Clavia Nord C2D Organ boasts 2 sets of physical drawbars per manual, and can replicate the B3 tone wheel organ and Vox and Farfisa transistor organs. It also features an amazingly sampled baroque pipe organ. Nord have performed great analysis on the 91 spinning tone wheels inside several original instruments and other intricate details that characterise the sound in a vintage organ. Nord's simulation not only reacts to the panel settings but even adapts to the real time performance, reproducing the important foldback and energy robbing characteristics. Even the gentle compression effect is created, which makes those lovely smears. There are 4 tone wheel modes available, which range the default vintage battered workhorse with plenty of leakage to a clean factory spec'd instrument. The Nord C2D boasts a greater mechanical key click simulation, whilst Nord has also carefully modeled the vibrato and chorus with the rotating scanner and its analog circuitry. The organ also has a redesigned percussion model, which gives increased control over the percussion levels when playing near-legato. This organ has two sets of drawbars per manual and a new left hand drawbar preset panel. These new preset panels allows you to instantly switch between drawbar sets and it has 3 user programmable drawbar preset buttons per manual. The Nord C2D 61-key waterfall keyboard is speedily responsive and boasts firm mechanical action for that original vintage instrument feel. The panel and upper manual has been tilted slightly towards the player and the panel between the manuals have a smooth surface making smears easy to do. The Nord C2D pipe organ is based on a carefully selected baroque organ with great sound and expression. Nord's cutting edge sampling technique has created a rich and varied sound palette for the player. The two pipe organ divisions (manuals) have their different sound characters; the Great division (lower manual) has a majestic sound, whereas the Swell (upper manual) boasts a somewhat more mellow tone. Couplers can activate combinations of different stops from both divisions, meaning that pressing keys on one manual can also play stops from the other manual or pedal. The Pedal division possesses three bass stops, which can be played either from the lower manual, by attaching a Nord Pedal Keys 27 (not included) or by attaching a 3rd party 30-note classic digital organ pedal. Along with the three unison couplers, the Nord C2D also boasts three octave couplers and a special coupler that adds the Pedal to the leftmost note played on the Great manual. The Nord C2D gives the player intimate control over volume and dynamics of the swell manual, just as in a real-life model. The tremulant function helps produce small and very rapid variations in volume, causing the sound to "tremulate". 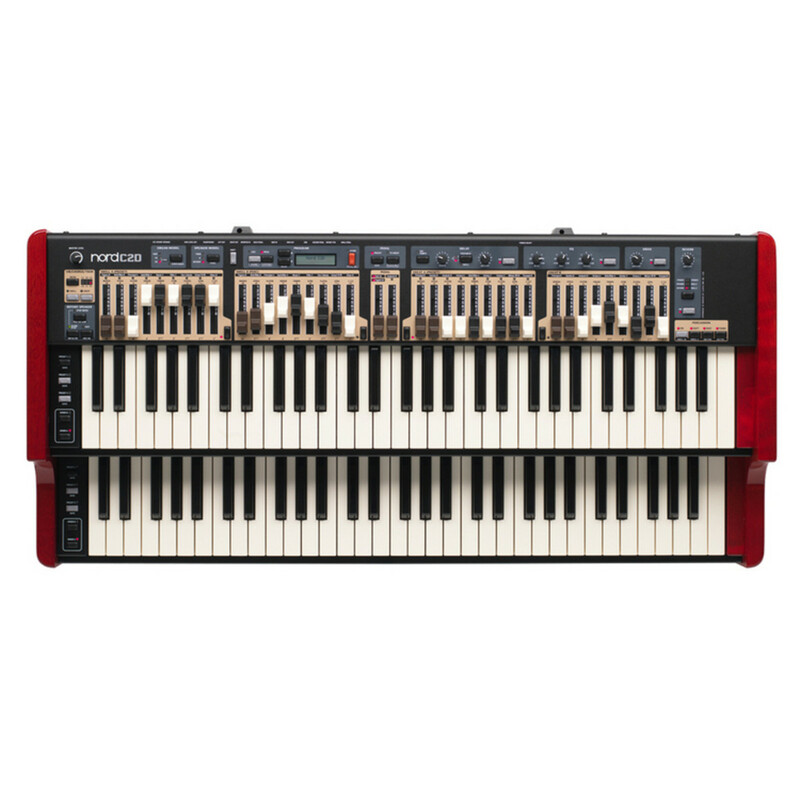 The Nord C2D boasts two speeds, each with three variable depths. The Nord C2D also has accurate models of the two of the most popular transistor organs of the 1960s, giving you that massive sound created by their 12-top oscillator frequency-divider designs. The Farfisa Compact Deluxe involves routing matrixes and complex filter combinations to create a tailored sound with massive energy and high-end. The Vox Continental has a brute design which brings a more hollow tone, but still with a very intense character. As with the tone wheel organ, both these transistor organs boasts their own personalities. The Nord C2D has 2 different rotary speaker simulations; one based on a 145 unit (also available in the Nord C2) and a brand new simulation of a vintage 122-unit. There are three modes - Stop, Slow and Fast mode which can be controlled either with the onboard panel buttons, an optional foot pedal (not included) or the Nord Half-Moon Switch (not included). Nord have also redesigned the rotary speaker overdrive simulation which. You can of course connect the Nord C2D to an external rotary speaker cabinet using the 11-pin Leslie* high voltage output or the high level ¼" jack output. Along with the Rotary Speaker model, the Nord C2D also boasts great Twin and JC guitar amp models with a powerful overdrive, freely assignable to the B3, Farfisa or Vox organs. Add the 3-band equaliser, a feedback-delay with tap-tempo functionality, and several types of reverberation. The Nord C2D comes equipped with a stereo output pair (L and R on 1/4" jacks) and a set of high level outputs (a 1/4" jack and a 11-pin Leslie* connector), providing flexibility to e.g. route the tone wheel to a rotary speaker and the pipe organ to a PA). The Nord C2D is of course capable of using any good quality expression pedal. Nord C2D includes two additional bass register drawbars with selectable timbre from vintage tone wheels, pipe organ bass stops or a synth bass, modeled after a famous vintage add-on unit. The bass section can be played with any MIDI-equipped bass pedal board connected to the dedicated Bass Pedal MIDI input, or by splitting the lower manual. The MIDI connectors allow you to use the Nord C2D to control other MIDI equipment or to use it together with a computer or sequencer, and the two manuals and the optional pedal can all be set to transmit on separate MIDI channels. Click on the link below for more information on the sections of the Nord C2D Combo Organ. Sustain Pedal Input: ¼", 6,35 mm jack. Use a momentary pedal, like e.g, Roland DP-2, DP-6, Yamaha FC-4, FC-5, Fatar VFP1-25 etc. Swell Pedal Input: ¼", 6,35 mm TRS stereo jack. Use a Control/Expression pedal like e.g. Yamaha FC-7, Roland EV-5 etc.